/cm/ - Cute/Male » Searching for posts with the image hash ‘71d0A6+1AnVRh489wIjCUg==’. Searching for posts with the image hash ‘71d0A6+1AnVRh489wIjCUg==’. 1 results found. Have a good new year, lads. A lot of people treat him as a trap or worse. I can brush it off since it's a thing that has been going on since 2011 but it's a reason why I haven't bothered to really read VG threads ever since I actually grew feelings for him. I understand he is feminine to some extent but I don't really see him as someone who'd enjoy that type of stuff. In the end he's just a regular dude with some feminine mannerism and a pretty face, and he's just fine the way he is. He started as someone very awkward and shy, someone who seriously lacked confidence in himself and was often bullied and beat up in school. He eventually grows emotionally much stronger and braver as he gains friends who back him up. He and his best friends end up being well known for being a really good card fighting team and he's clearly much more sound with himself after the time skip in G.
Blue is generally his main color for various things. Dog, due to how dog-heavy his VG clan is and how he seems to like dogs even outside the game. He's also by nature a very loyal friend to anyone he holds important in his life and does all he can to protect them, reminds me of puppers. His way of celebrating new years would definitely be more controlled. He's not completely opposed to alcohol if the spin off manga is anything to go by so he could maybe enjoy a glass or two of something but not go overboard. 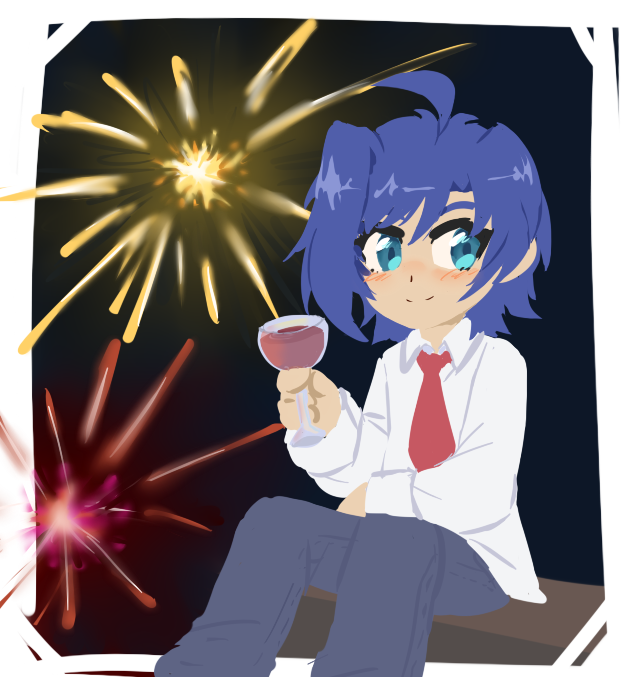 He would be one of those people who wants to make sure all his friends are doing alright through the festivities. His resolution would probably have something to do with people he cares about or just wanting to better himself in any way.